It is time for the next 52 Ancestors in 52 Weeks post. This week the theme is weather. I have written about this story before, but as I can think of no other weather related event that affected my ancestors at this time, I’ll repeat it. San Francisco and San Mateo are known for their wind. We often joke about how 75 degrees in San Francisco is not the same as 75 degrees on our side of the Bay. The wind comes off the ocean and it chills you to the bone. A few years ago, a cousin told me that my 3rd great grandfather, Martin Kelly, was killed on one such day. His saloon/boardinghouses were situated on Mission Road and fell right between the county lines of San Francisco and San Mateo Counties. I am not sure if he was at the 6 Mile House or the 7 Mile House the day that he died. Martin was outside one of his establishments when a big wind gust blew through. It spooked horses drawing a carriage. The horses bolted. Martin ran out into the road and tried to grabbed onto anything so he could stop the carriage. Unfortunately, he was brought down and trampled in the process. He did not survived. You may know that in 1906 most vital records for San Francisco were destroyed. 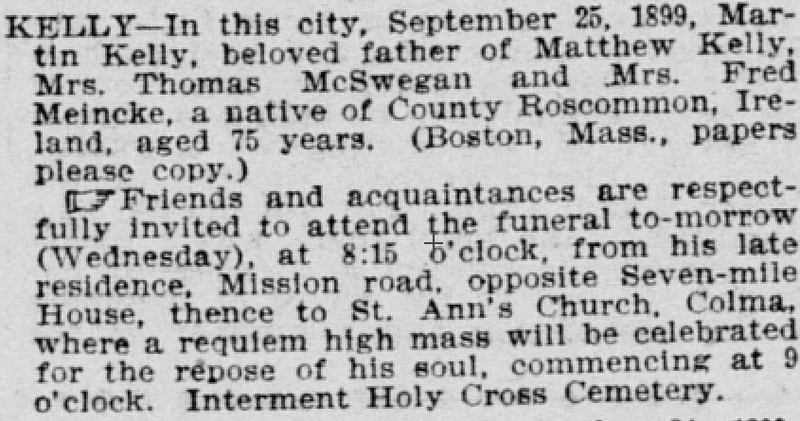 I have searched the San Francisco Call newspaper and found his obituary. However, my hope was to find a small snippet of a news article, anything that would prove the truth of the story. After searching the newspaper several days after the event, I have come up with nothing. I have even taken to the internet to see if I might find historical weather information for that day. But, I haven’t found sources for 1899. As a businessman and owner of multiple tracts of property in the San Francisco Bay Area, I had hoped to find some news snippet of his passing. It may be that I am looking in the wrong place. I have yet to explore records for San Mateo county. Who knows? A small newspaper on that side of the county line might have reported his death. For now, I’ve noted his cause of death as reported by my cousin. Unfortunately, the loss of records in 1906 may make it impossible for me to ever find the truth.